This afternoon the city parks department set a Sculpture in Gaither Park, the triangle at the corner of 8th and Nachand. This sculpture was the brainchild of Sandy Knott, who approached Dawn Struck with the Jeff High Arts Department last year and asked her to create something for this space. The sculpture is called “Swing” and consists of metal pieces welded together in the shape of an abstract leaf, symbolizing Sandy’s family farm which was located on that property many years ago. The colored baseballs at the end of each metal piece are a tribute to the nearby little league park. 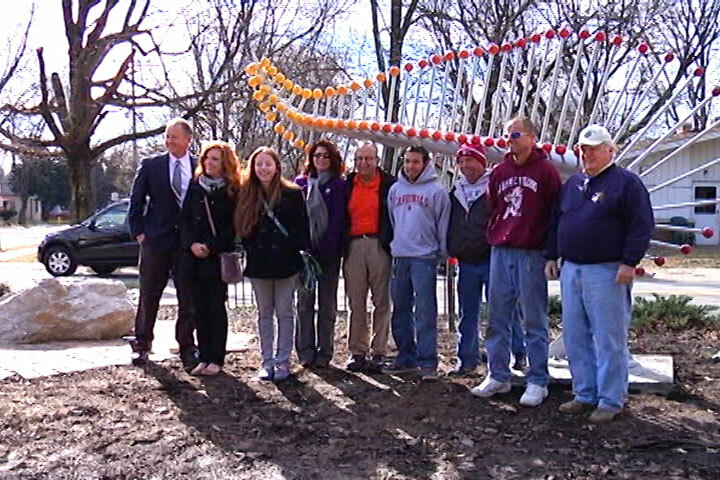 The sculpture was created by the Jeff High Art Club and Jeff High Welders. It will be paid for by the Urban Enterprise Association (UEA).